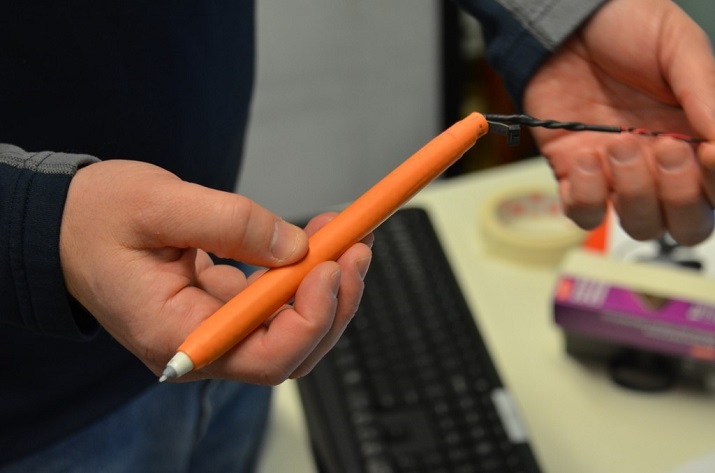 The organizers of WIPTTE 2015, the Workshop on the Impact of Pen and Touch Technology on Education, kindly invited me to speak about my recent work on sensing techniques for stylus + tablet interaction. 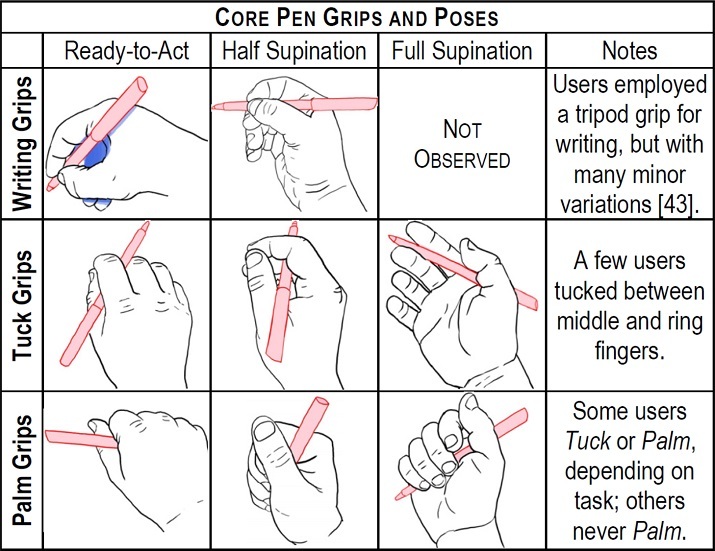 To design technology to fully take advantage of human skills, it is critical to observe what people do with their hands when they are engaged in manual activites such as handwriting. Notice my deliberate the use of the plural, hands, as in both of ’em, in a division of labor that is a perfect example of cooperative bimanual action. 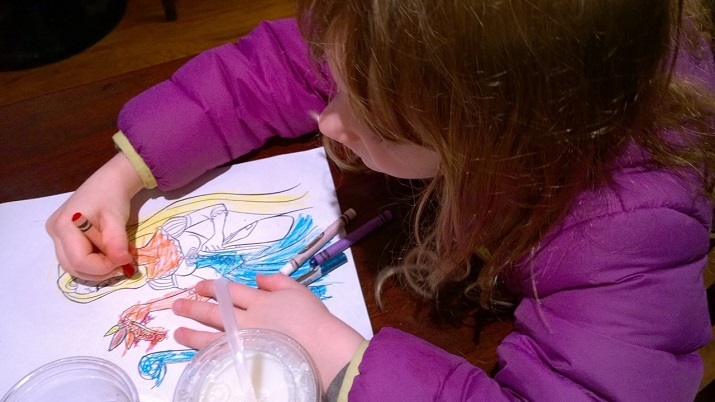 My six-year-old daughter demonstrates the power of crayon and touch technology. 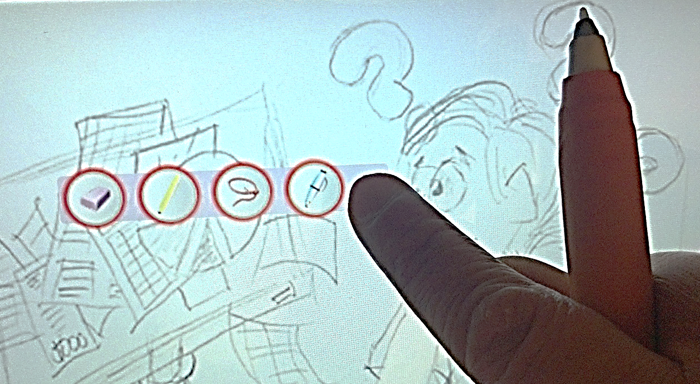 And of course I had my usual array of stupid sensor tricks to illustrate the many ways that sensing systems of the future embedded in tablets and pens could take advantage of such observations. Some of these possible uses for sensors probably seem fanciful, in this antiquated era of circa 2015. But in eerily similar fashion, some of the earliest work that I did on sensors embedded in handheld devices also felt completely out-of-step with the times when I published it back in the year 2000. A time so backwards it already belongs to the last millennium for goodness sakes! Now aspects of that work are embedded in practically every mobile device on the planet. It was a fun talk, with an engaged audience of educators who are eager to see pen and tablet technology advance to better serve the educational needs of students all over the world. I have three kids of school age now so this stuff matters to me. And I love speaking to this audience because they always get so excited to see the pen and touch interaction concepts I have explored over the years, as well as the new technologies emerging from the dim fog that surrounds the leading frontiers of research. I am a strong believer in the dictum that the best way to predict the future is to invent it. And the pen may be the single greatest tool ever invented to harness the immense creative power of the human mind, and thereby to scrawl out–perhaps even in the just-in-time fashion of the famous book Harold and the Purple Crayon–the uncertain path that leads us forward. Update: I have also made the original technical paper and demonstration video available now. 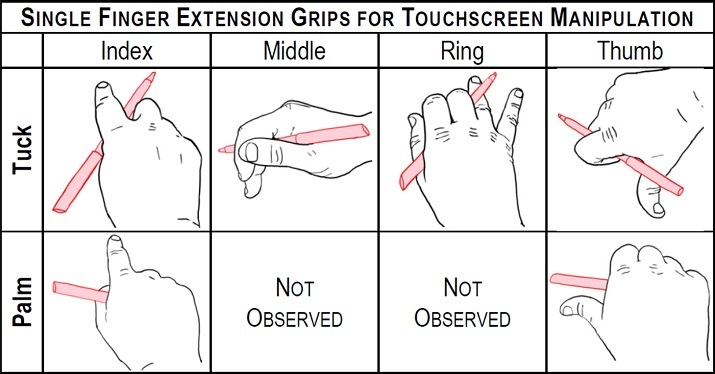 If you are an educator seeing impacts of pen, tablet, and touch technology in the classroom, then I strongly encourage you to start organizing and writing up your observations for next year’s workshop. The 2016 edition of the series, (now renamed CPTTE) will be held at Brown University in Providence, Rhode Island, and chaired by none other than the esteemed Andries Van Dam, who is my academic grandfather (i.e. my Ph.D. advisor’s mentor) and of course widely respected in computing circles throughout the world. With the big meaty man-thumbs that I sport, touchscreen typing–even on a full-size tablet computer–can be challenging for me. Take it down to a phone, and I have to spend more time checking for typographical errors and embarrassing auto-miscorrections than I do actually typing in the text. But typing on a watch?!? I suppose you could cram an entire QWERTY layout, all those keys, into a tiny 1.6″ screen, but then typing would become an exercise in microsurgery, the augmentation of a high-power microscope an absolute necessity. But if you instead re-envision ‘typing’ in a much more direct, analog fashion, then it’s entirely possible. And in a highly natural and intuitive manner to boot. Enter the Analog Keyboard Project. 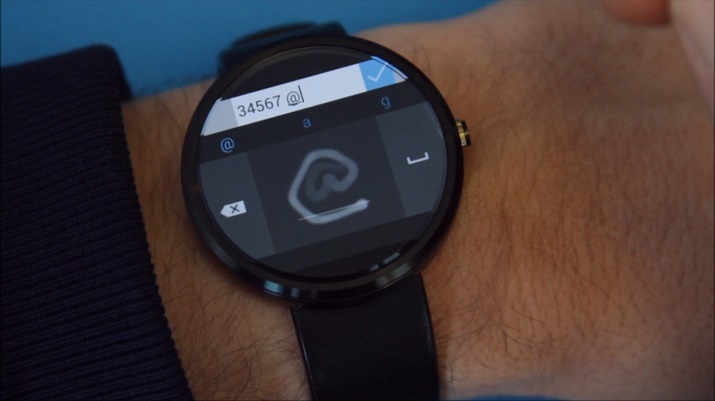 Wolf Kienzle, a frequent collaborator of mine, just put out an exciting new build of our touchscreen handwriting technology optimized for watches running the Android Wear Platform, including the round Moto 360 device that everyone seems so excited about. Get all the deets–and the download–from Wolf’s project page, available here. This builds on the touchscreen writing prototype we first presented at the MobileHCI 2013 conference, where the work earned an Honorable Mention Award, but optimized in a number of ways to fit on the tiny screen (and small memory footprint) of current watches. All you have to do is scrawl the letters that you want to type–in a fully natural manner, not in some inscrutable secret computer graffiti-code like in those dark days of the late 1990’s–and the prototype is smart enough to transcribe your finger-writing to text. It even works for numbers and common punctuation symbols like @ and #, indispensable tools for the propagation of internet memes and goofy cat videos these days. However, to fit the resource-constrained environment of the watch, the prototype currently only supports lowercase letters. Because we all know that when it comes to the internet, UPPERCASE IS JUST FOR TROLLZ anyway. 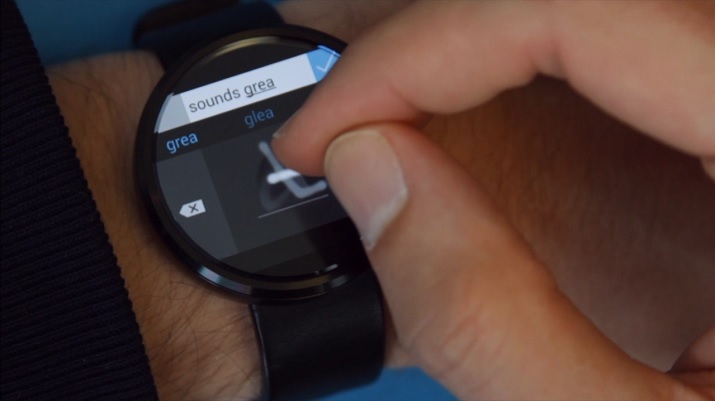 Best of all, if you have an Android Wear device you can try it out for yourself. Just side-load the Analog Keyboard app onto your watch and once again you can write the analog way, the way real men did in the frontier days. Before everyone realized how cool digital watches were, and all we had to express our innermost desires was a jar of octopus ink and a sharpened bald eagle feather. Or something like that. Y’know, the things that made America great. Only now with more electrons. You can rest easy, though, if these newfangled round watches like the Moto 360 are just a little bit too fashionable for you. As shown below, it works just fine on the more chunky square-faced designs such as the Samsung Gear Live as well. Check out the video embedded below, and if you have a supported Android Wear device, download the prototype and give it a try. I know Wolf would love to get your feedback on what it feels like to use the Analog Keyboard for texting on your watch. Bring your timepiece into the 21st century. You’ll be the envy of every digital watch nerd for miles around. Besides: it’s clearly an idea whose time has come. Here’s the final of our three papers at the MobileHCI 2013 conference. 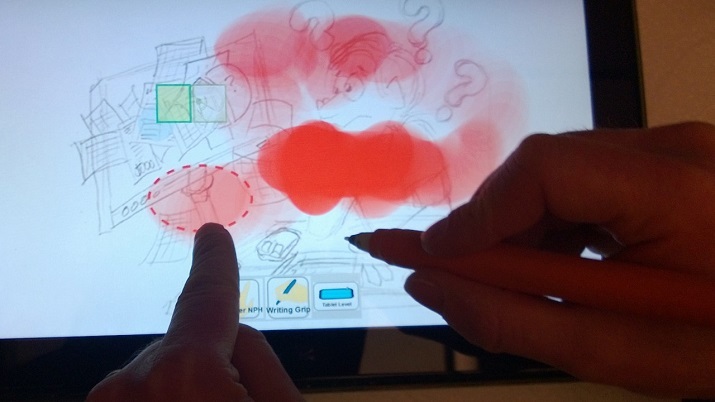 This was a particularly fun project, spearheaded by my colleague Wolf Kienzle, looking at a clever way to do handwriting input on a touchscreen using just your finger. In general I’m a fan of using an actual stylus for handwriting, but in the context of mobile there are many “micro” note-taking tasks, akin to scrawling a note to yourself on a post-it, that wouldn’t justify unsheathing a pen even if your device had one. The very cool thing about this approach is that it allows you to enter overlapping multi-stroke characters using the whole screen, and without resorting to something like Palm’s old Graffiti writing or full-on handwriting recognition. 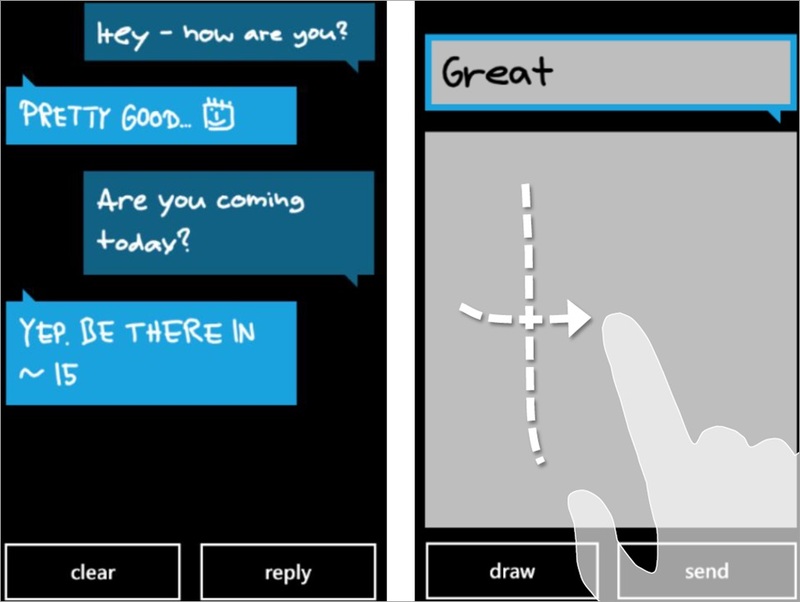 The interface also incorporates some nice fluid gestures for entering spaces between words, backspacing to delete previous strokes, or transitioning to a freeform drawing mode for inserting little sketches or smiley-faces into your instant messages, as seen above. This paper also had the distinction of receiving an Honorable Mention Award for best paper at MobileHCI 2013. We’re glad the review committee liked our paper and saw its contributions as noteworthy, as it were (pun definitely intended). This is my latest project, which I will present tomorrow (May 9th) at the CHI 2012 Conference on Human Factors in Computing Systems. I’ll have a longer post up about this project after I return from the conference, but for now enjoy the video. I also link to the PDF of our short paper below which has a nice discussion of the motivation and design rationale for this work. Above all else, I hope this work makes clear that there is still tons of room for innovation in how we interact with the e-readers and tablet computers of the future– as well as in terms of how we consume and manipulate content to produce new creative works. 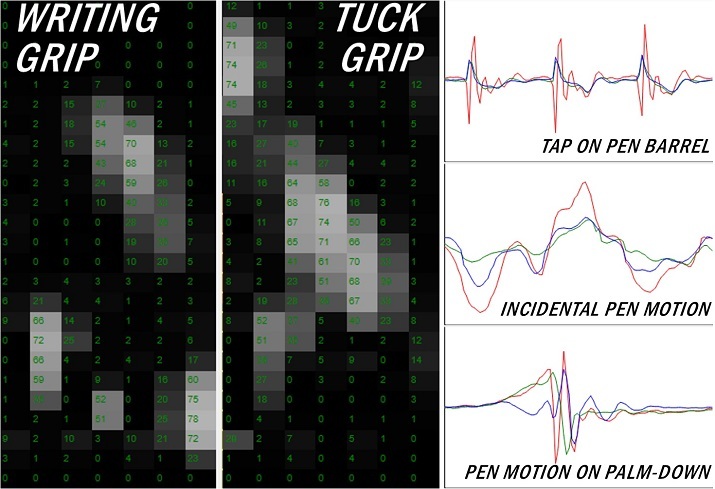 Sun, M. Cao, X., Song, H., Izadi, S., Benko, H., Guimbretiere, F., Ren, X., and Hinckley, K. Enhancing Naturalness of Pen-and-Tablet Drawing through Context Sensing. In Proc. ACM International Conference on Interactive Tabletops and Surfaces (ITS ’11). ACM, New York, NY, USA, Kobe, Japan, November 13-16, 2011, pp. 212-221. [PDF] [video – WMV]. 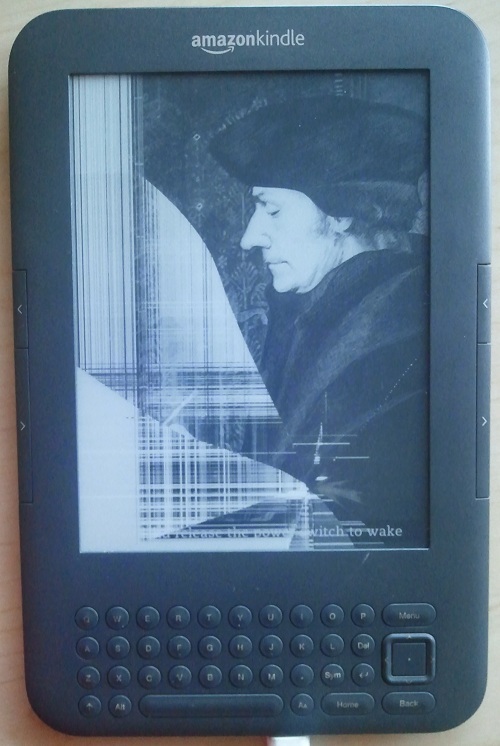 The bad news: I dropped my Kindle this morning. The good news: I caught it before it hit the floor. The man pictured in the screen saver offers his disapproval with a withering half-frown, a my-oh-my-what-have-thee done expression as he finds himself trapped forever in this doomed terrain of shattered e-ink. So, I guess it’s back to paper for me until my new Kindle arrives. For a long time I never thought I would have any use for a Kindle. After all, who wants to read on a computer? And what about marking up the text, dogearing pages, or having more than one book open on my desk at a time? Well, those behaviors are mostly my self-fueled obsessions when authoring original works of nonfiction. For recreational reading, the mechanisms for highlighting passages and bookmarking pages on the Kindle are, while somewhat clumsy and indirect, still good enough to get the job done. And then there’s the instant gratification aspect. This weekend up I was up at my cabin, at 3000′ elevation and nestled deep in the alpine pinnacles of the Cascade Crest, and I decided that I wanted to read another one of the mystery anthologies edited by Ed Gorman and Martin H. Greenberg because I recently read By Hook or By Crook on the recommendation of Kristine Kathryn Rusch and it was fantastic. So I just brought up the book in the Kindle store, paged through the related reads, and within sixty seconds of the impulse I was reading Between the Dark and the Daylight. But now I have to read the bloody thing on my smartphone until my new Kindle arrives. And while I wait, it occured to me that the fractured Kindle screen pictured above strikes a perfect image of the publishing industry and the entire state of reading these days. The old world has been shattered by feedback loops in technology and ongoing market forces that just keep reinforcing one another. Paper books ain’t going away soon, but I’ll probably live to see the day where they are uncommon for most titles. Bookstores will be relegated to specialty boutique status, like the camera and stationery stores populating the deserted shoals of strip-malls. And you know what that smells like to me? The Courier was one example of how these shifts might spawn whole new experiences or categories of devices. The Amazon Tablet might well be another. But whatever the next hot gadget or gizmo is, rest assured, I feel like a technological wolf, scenting a long series of innovations-to-come in the shifting winds, and I’ll be looking to make a killing. 🙂 What of tablets with pen and multi-touch? What of Nicholas Chen’s Multi-Slate Reading System, a federation of cheap slates that you can scatter about your office like the glossy marketing brochures you get in the mail, tossed aside for the day where you may or may not read them? What of flexible, paper-like displays? We’re still in the stone age here, folks, as far as e-readers are concerned. We’ll look back fondly on the Kindle and its ilk as the quaint auto-buggies that presaged a sleek, sophisticated, and nearly unrecognizable future. That’s where I want to be, even if I have to cobble it together with clunky prototypes, Frankenstein monsters of acrylic and delrin etched out by the laser cutter of my dreams. In the meantime, you could do a lot worse than to follow Kristine Kathryn Rusch and her husband, Dean Wesley Smith, as they talk about what this means for readers and writers and the publishing industry writ large.